There was a time when Scapa Distillery was just a collection of buildings you glimpsed over Scapa Bay, a northern arm of Scapa Flow. Its most distinctive feature was (and from a distance, remains) the way the distillery's name was painted in black on white on the sea-facing wall of a warehouse in a distinctly Islay-esque fashion. Anyone attempting to explore more closely would be greeted by a sign on the access road reading "sorry, no visitors". That all changed in 2015, when Scapa Distillery opened its doors to visitors, and to tours of the distillery, for the first time in its history. Scapa Distillery can be found not much more than a mile from the centre of Kirkwall, accessed (and signposted) from the A964 Orphir road. It would be fair to say that it's not Orkney's best-known distillery, but the contrasts between the scale of operations here and at Highland Park, only a mile away, mean that no self-respecting aficionado of distilleries would wish to leave Orkney without having visited both. Much is made by the owners of the distillery of the unique character of the whisky that is produced here, and of the unique way in which it is produced. Let's start with the latter. It's increasingly common these days to find distilleries whose processes are controlled from something that looks like the bridge on Star Trek's USS Enterprise. There's nothing wrong with that: indeed, such distilleries can be awe-inspiring places to visit. 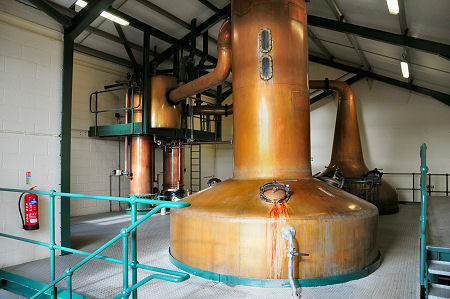 At Scapa Distillery, on the other hand, every process from milling to distillation is manually controlled and operated. Meanwhile, for anyone who associates large names painted on shoreside distilleries with the peated - sometimes heavily peated - malt whiskies of Islay, the character of the whisky that eventually emerges from Scapa Distillery might be a surprise. People talk of "honey" and "chocolate" and "spice' and "salt" and "vanilla". One thing no-one talks about is peat, making this in some ways the most un-island of the island malts. For someone who has only in the past seen Scapa Distillery from a distance, or even for someone who has driven through the extensive areas of bonded warehouses that lie between the main road and the visitor car park, the small and welcoming visitor centre can seem surprising. It's the first confirmation that this really is quite a small distillery and that the use by the owners of words like "artisanal" and "handcrafted" can be justified. 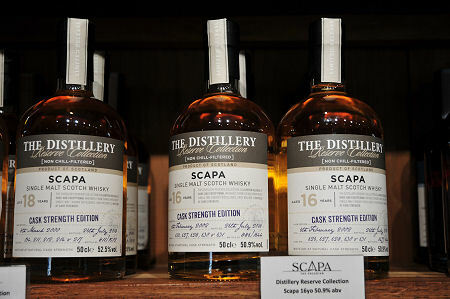 In distilleries, as in much else in life, size isn't everything: and the result of the small scale of the operation at Scapa Distillery is an enjoyably intimate experience for the visitor. 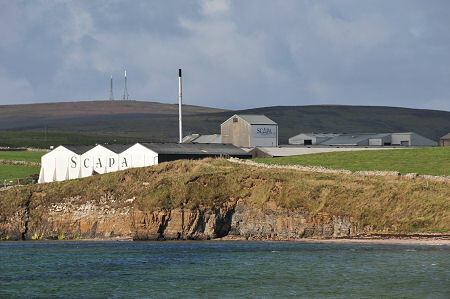 Several different tours, of different lengths and costs (and tasting opportunities), are available at Scapa Distillery: see their website linked from this page for more details. 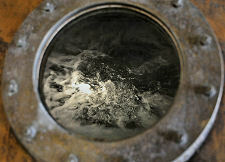 Suffice it to say that visitors are able to see for themselves all the mains stages in the production of Scotch whisky. You can find out more about Making Malt Whisky from our series of feature pages showing the stages in the process. 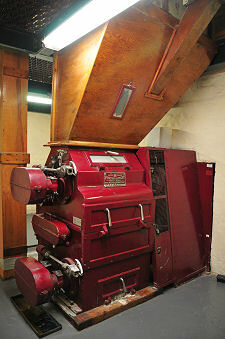 As with the large majority of Scotch whisky distilleries, malted barley is brought in from commercial maltings, so the first stage is the milling. This is done using a classic Porteus malt mill. From the malt mill you move on to see the large copper-topped mash tun in which ground malted barley is mashed to produce the "wort" (think of it like making tea). You then move into the larger room in which you find the eight stainless steel washbacks. Here the sugary "wort" is fermented to produce an alcoholic "wash" (think of it like making beer). For most visitors, the highlight of any tour of a Scotch whisky distillery will be the still room. These come in all shapes and sizes. At Scapa, the still room is relatively large, which gives plenty of space around the two stills, one wash still and one spirit still. Stills can also come in a wide range of shapes and sizes, but they tend to have bodies that are rounded in form and which lead upwards to necks that are usually reminiscent of swans. This is true for the spirit still at Scapa, but it is certainly not true for the wash still. 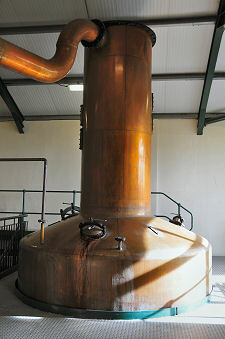 The wash still at Scapa is an exceptionally rare example of a "Lomond still", characterised by a broad neck and a flat top. 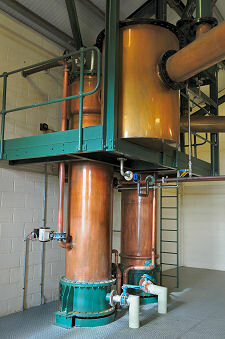 This type of still was invented in 1955 and intended to control the reflux in the neck of the still better than in traditionally-shaped stills. We've seen it said that the one at Scapa was brought here from a closed distillery on Speyside when the distillery was rebuilt in 1959. Not many were ever installed, and today this is the only one you'll find producing spirit for Scotch whisky: though another has been brought back into use for gin production at Bruichladdich distillery on Islay. The still room at Scapa has a rather nice spirit safe set slightly below the level of the stills that flank it. The room is also home to two condensers in the back wall, one for each of the stills. Nice touches in the room include a window in the spirit still through which it is possible to see the highly active spirit on the boil, and the ability to descend to a lower level to see the undersides of the stills. The spirit produced as Scapa is sent by tanker to Speyside to be put into casks, which are then brought back to the distillery to be matured in the bonded warehouses here. On the face of it, this seems economically counter-intuitive given the transport costs involved, including a double sea-crossing: but it is apparently the most cost-effective way of getting the spirit produced at the distillery into casks for maturation here. Bonded warehouses all have a highly characteristic feel and smell. The one we visited at Scapa was home to a high level racking system, which with computerised tracking via barcodes means the traditional craft of stencilling names and numbers on the cask ends is a dying art. Your tour will conclude in the visitor centre, where you can taste the Scotch whisky produced here for yourself. 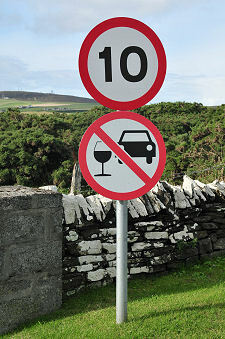 Though as the unique road sign on the road out of the distillery emphasises, it pays to remember who's driving home!